Dixa, a Copenhagen-based startup that offers a platform to help companies provide better and more consistent customer service across multiple channels, has raised $14 million in Series A funding. The round is led by Project A Ventures, with participation from early investor SEED Capital. Founded in 2015 by Jacob Vous Petersen and Mads Fosselius, Dixa is on mission to end bad customer service with the help of smarter technology to facilitate more personalised customer support. Dubbed a “customer friendship” platform, the cloud-based software works across multiple channels — including phone, chat, e-mail, and Facebook messenger — and employs a smart routing system so that the right support requests reach the right people within an organisation. 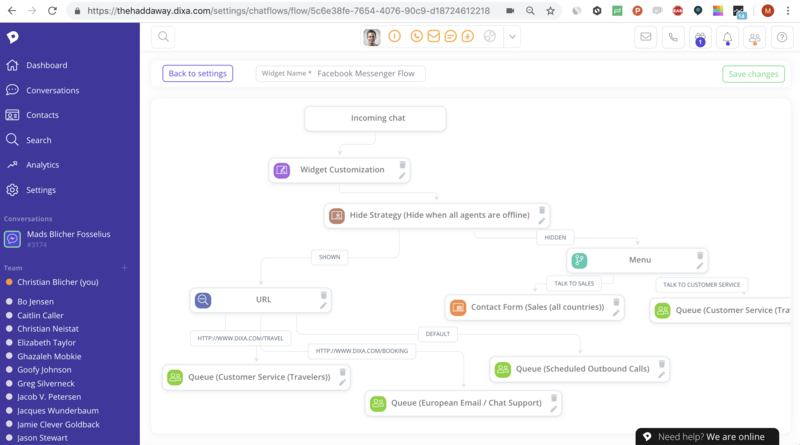 “The problem for customer facing support teams today is that tickets, shared in boxes and legacy call center solutions limit a brand’s ability to connect to their customers where they want to and add extra administrative burdens that ultimately harms the customer experience,” co-founder and CEO Mads Fosselius tells me. “Despite companies and brands promising stellar customer experiences and service, [with] digital transformation and technology vendors promising even more, the facts are that 75 percent of all customers have had a bad customer experience within the past 6 months and 70 percent say they will leave a brand after just one bad experience,” he says, citing Salesforce’s recent ‘State of the Connected Customer’ 2018 report. Dixa’s solution is described by Fosselius as a “next-gen” customer engagement platform built for personal and insightful conversations across all channels. To various degrees, it competes with Zendesk, Freshdesk, Salesforce Servicecloud and Avaya, Cisco, and 8×8. “Dixa is different as it’s a one channel-neutral platform and it works [how[ friends connect and communicate, but for engagement between brands and their customers. We call it a ‘Customer Friendship’ platform”. This sees Dixa help companies ensure that customers can always get the help they need when they need it and on the channel they prefer. The software’s algorithms smartly re-route requests to the correct human or bot based on a raft of data. This includes past conversations, orders, reviews, and sentiment. Additionally, the context is taken into account, such as the communication channel used, webpage visited, device etc., and the skills plus availability of the relevant customer facing employee. The result, says Dixa, is a system that makes it possible to deliver a consistent level of personal service, regardless of how the customer reaches out. To that end, the Dixa platform is targeting “customer-centric” brands with 5-500 customer-facing agents, such as scale-ups and companies in the travel, e-commerce, fintech and transport/delivery sectors. Its current customer base spans 23 countries and includes brands like Bosch, Interflora,Trustpilot, Danish design icon Hay, and food waste movement company Too Good to Go. Adds Fosselius: “We don’t believe in tickets and siloed ‘silver bullet’ customer support solutions doing one thing or one channel very well, the world of customer support is moving towards conversational customer engagement or ‘customer friendship’ as we like to call it, where the strong bond and relation between brands and customers are the center piece”.